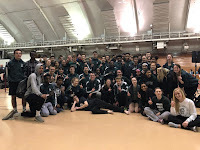 The Madison Memorial Track & Field team hosted the best athletes from the Big 8 Conference Tuesday night at Mansfield Stadium as teams competed for Conference Championships. The weather was balmy and storms threatened all night long but the rain held off until after completion and great performances were had by many Spartans. Both JMM teams performed at their best for the season and had excellent team totals. The boys compiled 84 points to claim 3rd place and the girls totaled 76 points for 4th place. This was a great kickoff to the championship season and provides great momentum for all Memorial Tracksters. Daurice F - long jump - 22' 1"
Holly H - discus - 122' 2"
Top 8 finishers scored points in the team competition, on the boys side this included: 2nd place by Micah P in triple jump (43' 11.5"), & 4x100m relay of Jake A, Daurice F, RaQuan Q, Jason W (43.78), 3rd by Micah P in the 110m hurdles (15.13), 4th place by Hunter P in the high jump (5' 10"), 5th place by Anthony H in the 400m dash (52.50), & Trevis M in high jump (5' 8"), 6th place by Jake A in the 200m dash (23.45), Jake R in the 1600m run (4:37.38), Micah P in long jump (20' 1"), & Trevis M in triple jump (41' 5.25"), 7th place by the 4x800m relay of Connor GT, Bryce H, Marcus F, Josh B (8:42.18), & Jeremy G in discus (130' 2"), and 8th place by Hunter P in 110m hurdles (16.33), 4x200m relay of Alex A, Eligh A, Hunter P, Alex B (1:35.39), & Ryan B in shot put (43' 11.25"). For the girls points came from: 2nd place by Siena C in the 3200m run (11:32.30), & Kayla G in pole vault (9' 6"), 3rd place by Meghan S in the 1600m run (5:17.81), Mariah OF in the 300m hurdles (49.34), & Christina M in discus (118' 2"), 4th place by Meghan S in the 800m run (2:26.01), Siena C in the 1600m run (5:20.06), the 4x100m relay of Margot W, Emma Cate M, Allison H, Julana DW (51.83), the 4x800m relay of Amelia F, Izzy O, Carly H, Caroline B, & Sydney S in high jump (5' 0"), 6th place by Margot W in the 100m dash (13.08), 7th place by Phibi M in the 100m hurdles (16.91), & the 4x400m relay of Amelia F, Gabrielle G, Mariah OF, Phibi M (4:29.17), and 8th place by the 4x200m relay of Joan M, Marcella V, Sarah H, Allison H (1:54.76). Great performances all around...lots of young faces making a name for themselves Many familiar faces providing some things to remember them by. Let's keep this momentum going for Frosh/Soph Boys in Janesville on Tuesday, JV Girls in Beloit on Wednesday, and varsity kids competing at Regionals next Tuesday. A BIG THANK YOU to the parents, athletes, & volunteers who helped Madison Memorial host a terrific event Tuesday night...we couldn't do it without you!! !